Vietnam, a fascinating country, has long tail of coastal provinces washed by the warm waters of the South China Sea. With dramatic limestone cliffs emerging from emerald green waters, the wonderful scenery of Halong (Hạ Long) Bay, the picturesque seaside resort in Hoi An (Hội An), the extraordinary floating villages on Mekong Delta, … Vietnam has become a popular destination for tourists worldwide. For more information about this beautiful S-shaped South Asian country, you should read on this article about holidays in Vietnam, which somehow will help you choose the best time to start perfect trip to Vietnam in the future. There are many holidays in Vietnam, but here we just list down 7 out of biggest holidays in Vietnam, which are widely celebrated countrywide. The first one when it comes to holidays in Vietnam is New Year day. This special day is celebrated all around the world and Vietnam is not an exception. Most of the anniversaries, festivals as well as traditional cultural events in Vietnam are according to the lunar calendar. However, nowadays, Christian calendar is currently widely used throughout this country. Annually, one the first day of the New Year in Western Calendar, also joining in the modern breathes of the global, Vietnam also greatly celebrates the International New Year Day. The holiday aims to serve the purpose of saying goodbye to an old year and welcome a new year. Beginning from the period of French colonization as Western calendar started to be used, the New Year Day has been widely celebrated. New Year is the time at which the new calendar stars and the year increments of the calendar count by once. At many cultures, they celebrate this event in a few manners. The New Year of Vietnam falls on 1 January each year. This time, office staff, employees, workers, students, pupils are off from work, only services for tourists are still maintain. In two big cities of Vietnam like Hanoi (Hà Nội) and Ho Chi Minh (Hồ Chí Minh) City, this is the occasion for people working or studying far from home to come back their hometown for visiting their families or to go on holiday for relaxing. The New Year Day also brings people a good chance to go out, meet others and join in exciting activities as well. On the holiday, related programs would be broadcasted on both national and local, and those countdown parties would be held at places like major avenues or Opera House. Tet Nguyen Dan (Tết Nguyên Đán), also called Tet (Tết) for short, is the most important one among holidays in Vietnam. Tet falls on the first night of the new moon of the first month in Lunar Calendar, which in the Western calendar often happens between the last week of January and the third week of February. Celebrated on the 1st of the first month in the Lunar Calendar, the celebration of Tet is the longest holiday which might last up to 7 or more days. The specific days taken will depend on how the dates will fall over a weekend, and additional days might be declared holidays to bridge to the weekends. Tet in Vietnam is celebrated on the same day of Chinese New Year, despite there is one hour time difference between China and Vietnam. This could sometimes lead to alternate calculations when the new moon happens. Tet Nguyen Dan signifies the start of the New Year and also marks the first day of spring traditionally. At the start of the Tet Nguyen Dan (Tết Nguyên Đán), Ong Tao (Ông Táo), the god of the Health in the belief of Vietnamese people, will go to the abode of the Jade Emperor in order to give his annual report on each family member. Family members begin cleaning their own houses and decorating them in beautiful ways with a lot of accessories – the process that must be done before the New Year’s Day because if done after that, all the good lucks will go away. Additionally, people purchase or prepare the items that are exclusive in Tet Holiday, such as candied seeds and fruits, pickled onion, Chung (Chứng) Cake, Day (Dày) cake, and pork bologna. Vietnamese people will buy new clothes and give gifts to their family members and friends. Another thing to remember is that everyone needs to pay off all the debt before the beginning of a new year as remaining debts from one year to another will be reckoned as bringing bad lucks. A key part of Tet celebrations is that it is an opportunity to start again, to forget all about the sadness and problems of the last year and being afresh. Apart from cleaning houses and buying new clothes, this is also a popular time for people to switch careers or change jobs. On top of the new beginning, Tet also sets the tone for the upcoming year, so popular customs often include warm family reunions, giving money to the elderly and children, ancestor worship, etc. At the midnight of the start eve of the New Year, Ong Tao (Ông Táo) will return and be welcomed back with gongs and fireworks. In this time, Vietnamese people will avoid thinking of bad thoughts or arguments in case they allow such bad spirits into their house. A popular event for marking New Year in the big city of Vietnam like Ho Chi Minh City is the Flower street, which attracts a large number of visitors annually. The symbolizing animal of the New Year will be presented along with a lot of flowers. The meal that completes the whole year, New Year’s Eve – Tat Nien (Tất Niên), should be adequately served, in which everybody involved will remember all happy moments and talks about just good things. 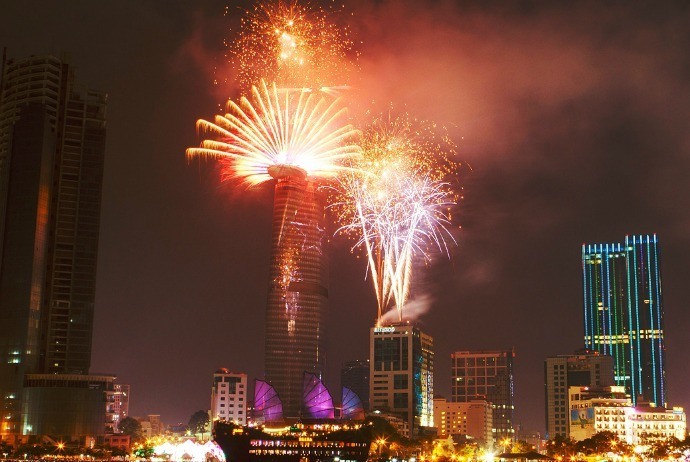 On the special moment of the New Year’s Eve, Giao Thừa, Vietnamese people often have a particular celebration involving the whole nation – some might gather around TV and happily watch the Táo Quân show, some might go out for observing fireworks. As the bell of the special twelfth hour exactly rings, everyone gathers, at those parties or simply at the comfort of their homes, happily saying Happy New Year to each other in warm hugs, throwing behind all the problems, and hoping for a new better start. On the New Year’s Day of Tet Nguyen Dan (Tết Nguyên Đán), the first person who comes to visit families – called first-foot – are considered as very important and therefore need to be well chosen, because they are believed to hold in hands the luck of the family in the new year. After that, till the third day or fourth day of Tet Nguyen Dan (Tết Nguyên Đán), people meet relatives, colleagues and friends, wishing them all types of good things like health, happiness, and success. Lucky money in little red envelops are given to children and the elderly as red presents good lucks. Like other Asian countries, Vietnamese people also believe that the red and yellow colors can bring good fortune, explaining why these colors could be seen everywhere in Tet. Also, they visit temples and pagodas to respectively pray f or a good start and lucks in the coming year. In Vietnam, there is a saying, “Father’s Tet is on the First day of New Year, Mother’s Tet is on the Second, and Teacher’s Tet is on the Third.” To explain for this quote, it means that on the first day of the Lunar New Year, Vietnamese people should visit their parents on the husband’ side on; on the second day, they should turn to parents on the wife’s side; and on the third day, they visit their teachers. 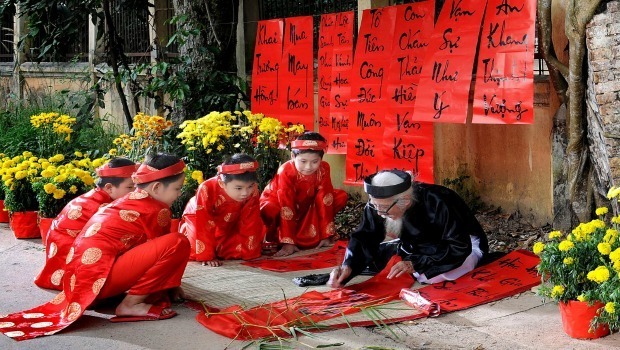 Tet, among many national holidays in Vietnam, has a special attached meaning to Vietnamese people. It is time for everyone to relax after a hard-working year. If you are visiting Vietnam at this special time of the year, make sure that you join this national festival of holidays in Vietnam and happy moments of local people. 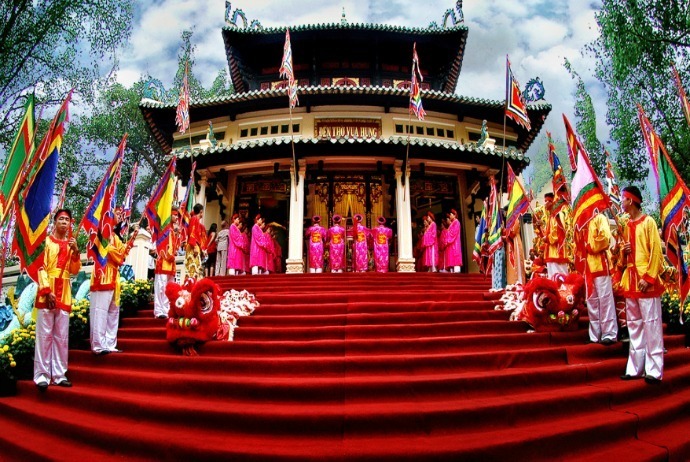 Considered as one of the public holidays in Vietnam, Hung Kings Temple Festival is for worshipping Hung Kings, those people who make huge contribution to the establishment of the country in its first start. Anniversary for death of Hung Kings has a goal of educating Vietnamese youth about their traditional root. In the past, the festival used to last for three separate days from the 9th to the 11th of lunar March – the 3rd month of the calendar year. However, since 2010 the festival lasted from the 1st to the 10th of lunar March. It is said Vietnamese people nowadays are the descendants of Lac Long Quan and Au Co. Lac Long Quan and Au Co after getting married had 100 children, and the son who were eldest among them became the King of Van Lang and built his kingdom in Phu Tho (Phú Thọ) Province these days. 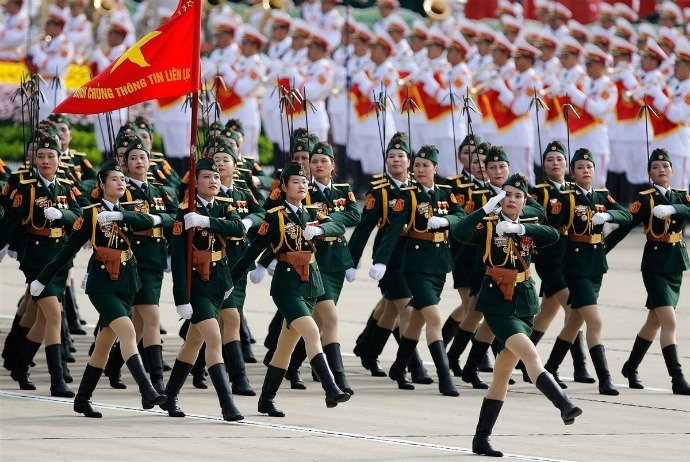 Over generations, the reign of Hung Kings has become a crucial period of Vietnam’s history, setting up for the foundation, tradition, and culture of the country and also lots of national values, including sense of community, patriotism, mutual fondness, and the aversion towards the invasion of foreign countries. Among holidays in Vietnam, Hung Kings Temple Festival is the national festival which is strictly and carefully conducted. 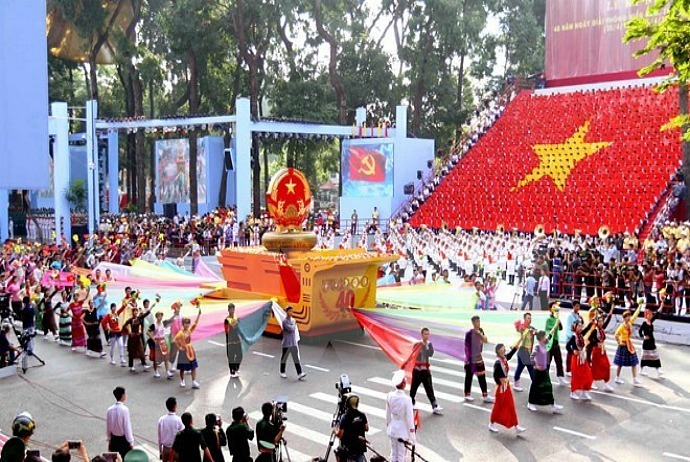 Previously, in those even years, this festival is celebrated nationally with the presence of head of state of Vietnam. In odd years, it is empowered to the hand of the government of Phu Tho (Phú Thọ) province. However, since 2007, Vietnamese people have been nationally allowed to be off from working on this holiday. There were not differences between even years and odd years in regard to celebration. People nationwide and oversea gather at the respectful Hung King Temple in Phu Tho(Phú Thọ) province to join in solemn ceremonies. Taking part in those ceremonies, people from all corners of Vietnam, regardless of ages, sincerely pray their ancestors for having blessed lives. In addition to the ceremonies, Death anniversary of Hung Kings contains a few cheerful activities such as performances of Quan Ho (Quan Họ) singing, Cheo (Chèo) singing, Xoan (Xoan) singing, and games of rice cooking, chicken kicking and chess playing. In general, death anniversary of Hung Kings is considered as a great chance for Vietnamese both at home and abroad to strengthen the long-lasting tradition of patriotism, gratitude, and boost the national solidarity of the country. This is one of public holidays in Vietnam. 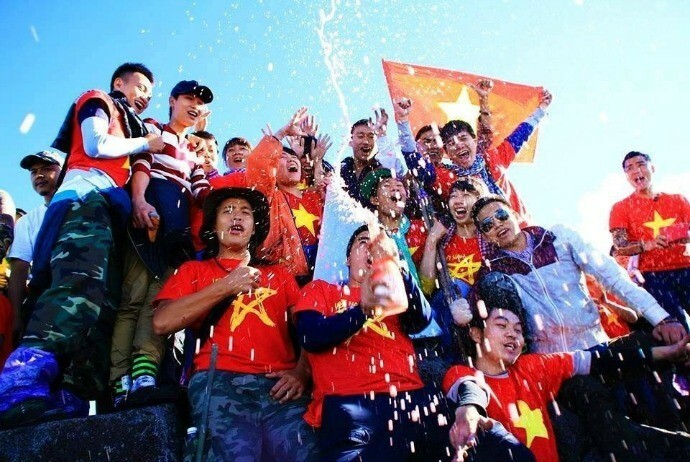 Annually, on April 30th, Vietnamese citizen have one day off from work to celebrate an important national event which is called Reunification Day. In 1975, on the 30th in April, the Vietnam War was ended officially. It started the transition period leading to the formal reunification of Vietnam, bringing liberty and peace for Vietnamese people and opening the way for Vietnam’s sustainable development. These days, April 30th is nationally celebrated annually. Most main cities host music shows performing victorious songs from the fierce war. Every house is required to hang a red nation flag right in front of their door, and the streets of the city are proudly lighted up with red flags and banners. The majority of offices; both based in Vietnam and the Vietnam offices based aboard, will be officially closed during this time. The Labor Day is among public holidays in Vietnam that is commonly associated as the commemoration of the achievements of labor movement. Together with over 80 countries around the world, the International Worker’s Day, also known as May Day, is celebrated on the first day of May each year, after the Reunification Day. As a result, two these special days are joined together to create a single long break. In a few special years when both of these holidays fall on weekends (Saturdays and Sundays), Vietnamese citizens will be off from work for up to 4 consecutive days. On this occasion of holidays, offices and services such as schools, banks, and many governmental institutions are off, just tourist service is on. Many people use International Labor Day as a chance to travel in Vietnam. This time, Vietnamese people visit their family members in hometown after busy months from the lunar New Year to the first day of May. This chance keeps Vietnamese families together, which is a vital aspect of the culture of Vietnam. Vietnamese citizens who live in big cities like Hanoi (Hà Nội) and Ho Chi Minh (Hồ Chí Minh) City usually head back to their home town or go on a holiday in tourists destinations. Consequently, those destinations get crowded and the price tends to be added up. As mentioned earlier, some Vietnamese citizens will either head back to their hometowns or head to the countryside or beach with their families and friends to relax. Among locations for vacation during the Reunification / Labor Day holidays, some of the most favorite are Hoi An (Hội An) (an old town which is nearby a well-preserved ancient city), Phu Quoc (Phú Quốc) (a resort area with white sand beaches and chances for outdoor activities and water sports), Mui Ne (Mũi Né) (an island with beautiful beaches and chances for water sports), and Halong Bay (Vịnh Hạ Long) (a famous bay of Vietnam with chances for rock climbing, sea kayaking, boat tours and hiking). During the Labor Day, both international and domestic tourists could visit some major cities of Vietnam. As most of the residents of the city are at vacation spots or their hometowns, large cities get much quieter as well as less busy than normal. It is also a great time for people to enjoy great attractions or city hotspots without handling the crowds. When visiting Hanoi, you could experience Vietnam’s capital and a wide range of historical exhibits about French colonization, war, and more. Those visiting Ho Chi Minh City could eat, shop, and head to museums this time. A lot of museums in Saigon (Sài Gòn) specialize in war history and Vietnam under the rule of France. Also, there are a few art exhibits. For those who want to enjoy a little bit chilly but fresh air, then the small town of Sapa (Sa Pa) is a great suggestion. If you want to avoid the crowds, then Danang(Đà Nẵng) should not be an option this time. Whilst many employees in Danang (Đà Nẵng) will come back to their homes during this holiday, the city is often filed with travelers and vacationers because of many nearby beaches as well as resorts. Those deciding to travel during the holiday of Reunification Day – Labor Day should know that the costs for transportation are often inflated. Trains, buses along with other means of public transportation will be usually at maximum capacity and needs long waits. It is recommended to book transportation and lodging in advance if you wish to travel during these holidays. Indeed, in regard to holidays in Vietnam, International Labor Day is a time for people to celebrate friendship, family bonds, and nice warm weather. Vietnam national day is always celebrated on 2nd September in order to mark the declaration of independence of Vietnam from France. It is one of the biggest public national holidays in Vietnam. This crucial political, historical, or cultural event is associated with its current status. With a variety of activities found in this special day, like fireworks shut in the sky, marches organized widely on streets, this is a great chance for tourists to understand more about Vietnam and its history and culture. Before and during this patriotic holiday, the national flags of Vietnam are displayed everywhere and large posters of Uncle Ho – Ho Chi Minh (Hồ Chí Minh) are adorned city walls. Among holidays in Vietnam, this is popular Vietnamese holiday which happens on the 15th day of the 8th month in accordance with lunar calendar, near the autumn equinox – mid September to early October. 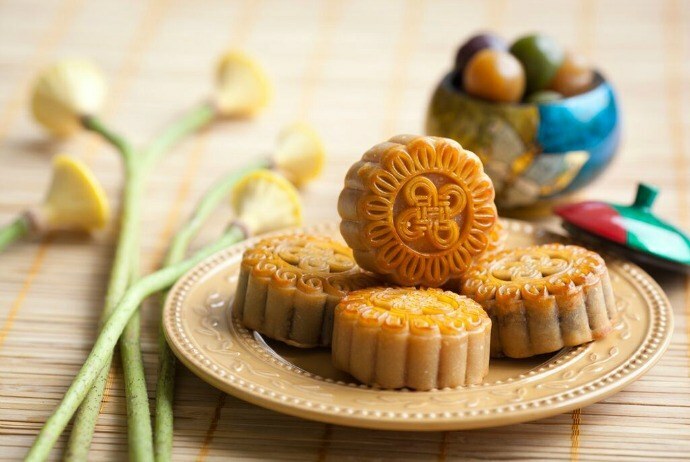 Also known as “Children’s Day”, the Mid-Autumn Festival has a different meaning in compared with China, despite Vietnamese people also celebrate this holiday by eating mooncakes. 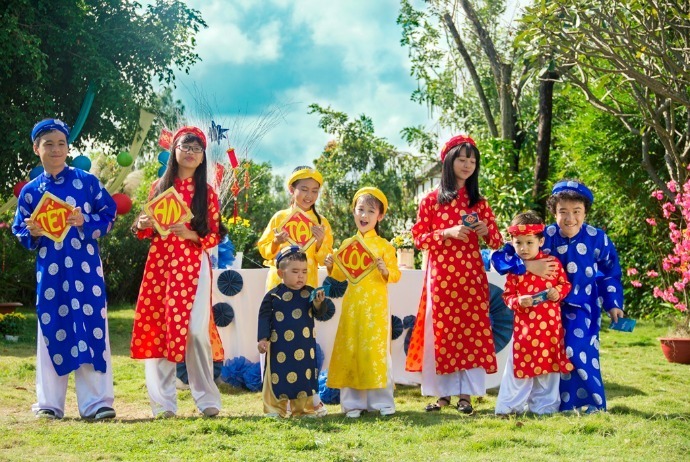 The Mid-Autumn Festival in Vietnam is considered as the happiest day for kids, during which parents will purchase a variety of types of snacks and lanterns for their children. There are a wide range of activities taken place to celebrate the Mid-Autumn Festival in Vietnam. 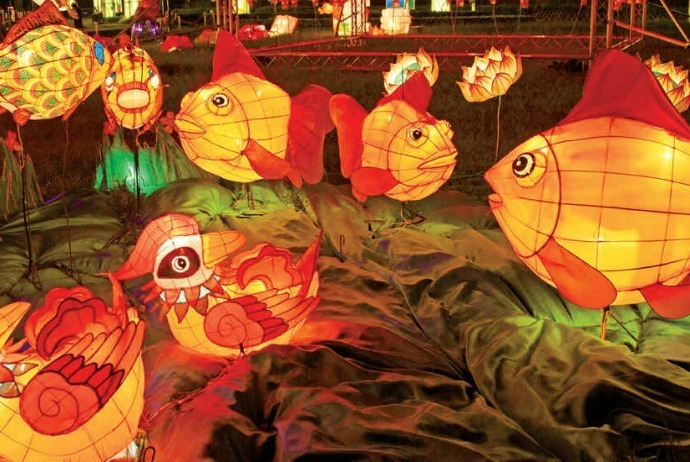 The major activities in this special day of holidays in Vietnam could be worshipping the God of Earth and carrying those carp-shaped lanterns. Oftentimes, a worshipping platform is carried out in the house yard during Mid-Autumn night, on which fruits, moon cakes (bánh trung thu), and snacks are all laid with nice decorations. Later, those family members will sit together to enjoy the food whilst appreciating the moon. This platform will not be taken until midnight, when the food is entirely eaten up. Nonetheless, most families set up a special platform for their kids, so that they could enjoy fruits and food anytime in the evening. For Vietnamese people, it is a tradition to light up the lanterns during Mid-Autumn night. With various types of paper lanterns, children have a lot of choices to opt for and play with whilst eating moon cakes during the Mid-Autumn evening. 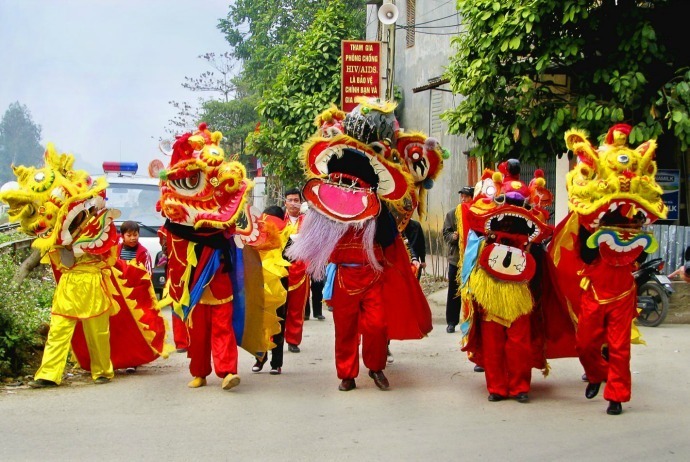 Some other interesting art and literary activities are also organized throughout Vietnam during this festival, such as lion dances, dragon boat races, lantern fairs, and so on. Some details about lion dances – one of the most visible traditions related to the Mid-Autumn Festival are: on the nights leading up to the special day, groups of kid parade through streets – some of the kids maintain a martial beat on the drums whereas others will control an extravagantly decorated head of “lion” crafted from paper and mold. Then, the kids will approach businesses and homes and ask owners for the allowance to perform. If the owners agree, the kids will put on the show believed to bring a blessing of fortune and luck. Afterwards, the host will give kids lucky money as a signal of gratitude. Nowadays, these lion dances become fascinating that attract a large amount of children, ranging from little children to teenagers to take part in. some are rather professional while others might be a bit disorganized. As a result, there are many groups of children who march around, the streets echo with the sound of drums as if there are dozens of lions roaming about. In general, traveling and discovering the country during big holidays in Vietnam will be a great chance for tourists to get to know more about a great history and also rich culture of Vietnam.